This is a small excerpt from Mark Zuckerberg’s post of January 2018 on announcing major changes for the year and since then, the murmuring has followed big changes. Facebook decided to change their news feed algorithm and make the Facebook experience more interactive rather than being bombarded with business posts. Till now we had been getting posts from brands and businesses which were organic for them. 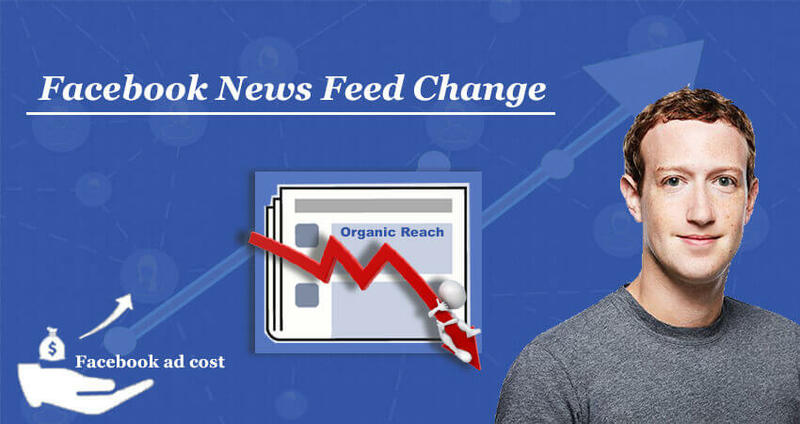 This change has altered that experience forever and Facebook now cuts down the visibility of such (organic) posts to us and shows more posts from friends and family. This means if you are a business and were not spending much or at all on paid ads, would now need to pay to get fairly good visibility for your post. As said above, Facebook feels the social portal should be used by people to connect with each other but in the wake of the fake news supply on Facebook of the 2016 US elections it received harsh criticism from around the world. Zuckerberg in the post said the passive use of social media could be dangerous for the people and the time people spend on Facebook should be more meaningful. This change would obviously affect businesses and brands the most. Till now the news feeds from these businesses were getting a good visibility, eventually helping them grow. This move would push the brands to use paid promotions that would help Facebook grow its revenue. There is one evident way that would help businesses keep growing, but it comes at a cost. Although with the tight marketing budgets, it would actually be difficult to pump in more money for marketing expenses. As a business, you could yet do certain things that would engage people from Facebook without paying. Facebook comes with a feature wherein you could prioritize the visibility of your posts to people you want. Brands can encourage the fans and followers of their Facebook page to prioritize the posts of (these pages). This would help in improving the visibility of posts (of brands) without spending anything. Facebook Live is one of the vastly used features today. Facebook says that the interaction on Live videos is 6 times more than the non-live videos. Businesses should start going live more often to get the desired engagement. Again this is completely free and you don’t incur any cost. Facebook groups gather a lot of interaction, the reason being a group is generally made of like-minded people. A content marketing strategy could be deployed by the brands by creating product-relevant or business-relevant groups where people who share these common interests could interact. Many people might not be knowing that Facebook made an endeavor to let make aware of local events with Facebook Events app. Sometime back Facebook relaunched and rebooted the app as—Facebook Local. Facebook Local could be said as a combination of Yelp, Foursquare and its predecessor—Facebook Events. The app tells the users about recommendations, reviews and also see friends who are nearby. Local businesses can be benefitted by the app by getting themselves on the app. This is the time to use Stories like never before. Not a very old feature introduced by Facebook, it is similar to the WhatsApp feature called Status. The feature encourages frequent use by the profile owner and thus generates more engagement. Brands could make multiple stories in a day to get a substantial amount of visibility. Well, many experts from the industry believe that this change is sort of price elasticity of demand. As the visibility of the organic posts is restricted, the demand for paid ads would go up and this shift in the demand would be dearer to the brands as they would have to increase the marketing budgets if not the price of the ads goes up. As of now, there is nothing to corroborate this fact, but the as the Quarter 4 results of the year would be out things would be much clear.